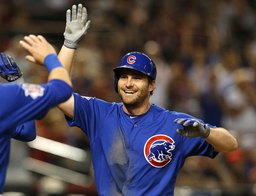 DENVER (AP) Daniel Murphy had no second thoughts about the Colorado Rockies bringing him in to play first base. As for taking his kids to get a picture with Santa at the mall just days before the holiday? Hey, at least the whole family was wearing Rockies purple for the photo. "Stood in line for an hour and a half," Murphy cracked Friday in a teleconference call from Jacksonville, Florida. "I'm just excited it all went through." The 33-year-old Murphy signed a $24 million, two-year deal that includes a mutual option in 2021. Although he's played way more games at second base, the plan is for Murphy to take over at first. That means Ian Desmond will move to one of the outfield spots. It's another way to add a little more sizzle to the lineup after the Rockies batted a franchise-worst .256 in 2018. A lifetime .299 hitter, Murphy figures to raise that batting average. "A professional hitter for a long period of time," general manager Jeff Bridich said. "He has a lot of different skills as an offensive player that I think will complement the guys we theoretically have in our lineup." Murphy's place in the batting order probably won't be determined until manager Bud Black gets a feel for things in spring training. Murphy does have a preference, though - anywhere that helps. "I like to fancy myself as pretty low maintenance," Murphy said. "They're going to construct a lineup each and every night they think is going to put us in the best position to win baseball games. Wherever my name ends up, that's my favorite spot." This is how his deal breaks down: Murphy gets $10 million in 2019 and $8 million in 2020, and the deal includes a $12 million mutual option for 2021 with a $6 million buyout, of which half is deferred without interest to January 2022. He can earn $100,000 for Comeback Player of the Year, $100,000 for World Series MVP, $75,000 for League Championship Series MVP, $50,000 for Silver Slugger, $25,000 for Gold Glove, $25,000 for All-Star, $100,000 for league MVP, and $50,000 for finishing second through fifth in the MVP voting. If he earns any award bonus, the option buyout increases to $7 million, of which $4 million is deferred without interest to January 2022. In addition, Murphy would get a $2 million assignment bonus each time he is traded. Murphy started slow last season as he recovered from right knee surgery. He said he underestimated just how long it would take to get back into the swing of things. He still hit .299 over 91 games with Washington and the Chicago Cubs, a team that traded for him in August. "There were certain things that my body didn't do that it did pre-surgery," the three-time All-Star said. "But I think that was more a function of being that close to surgery. I'm hoping that an entire offseason to get healthy, to get strong, to get further away from surgery, I'll look a little bit more like I did in 2017." Or 2016 for that matter, when he hit .347 and was second in the NL MVP voting. It wasn't hard to sell him on joining the Rockies, given a lineup that boasts Nolan Arenado, Trevor Story, Desmond and Charlie Blackmon. "Hopefully I can step in and fall into place and try to extend a lineup that is already really potent and really dangerous," Murphy said. Over his career, Murphy has appeared in more games at second base (834) than first (225). Still, he said he feels comfortable at first. "I don't think I'm breaking any new ground to say I was never probably an elite defender at second base," Murphy said. "I'm probably a better defensive player at first. First base is going to be a place that I can best impact this ball club in a positive way." He brings leadership, too. He's been a postseason regular in recent seasons, including the 2015 World Series while with the New York Mets. The Rockies have been to the playoffs in back-to-back seasons for the first time in franchise history. They were eliminated by the Milwaukee Brewers in the NL divisional round in 2018 after knocking off Murphy and the Cubs in the wild-card game. "His track record in the postseason speaks for itself, in terms of however you want to put it, either rising to the occasion or being a relaxed and confident player under stressful conditions," Bridich said. "The expectation and the hope is his slow heartbeat and his experience can make our team better in those types of stressful situations."